Aluminium, the mostly used element in the world, and its usage is increasing in many applications. Aluminium acetate (AA) has been used in many therapeutical applications, too. Because of widely usage of AA in medicine, its safety must be clearly defined. This research evaluated the genotoxic effects of AA. It has been known that aluminium had very important toxic effect in long time exposures. It was aimed to determine if AA had same genotoxic effects or not. Genotoxic effects of AA were determined with human lymphocytes MN assay. Control, Negative control (1% DMSO), positive control (MMC, 0.20 µg/ml), 1250, 2500, 5000, 10000, and 15000 ppm doses of AA were used in this assay. MNBC % and NDI values of AA were compared with negative control group. 15000 ppm of AA were observed as EC50 concentration that reduced the mitotic index about 50 %. As a result of MNBC %, there was statistically significant increase in MN frequency at 5000 and 10000 ppm doses. Dose-dependent cytotoxicity were obtained from NDI study. The highest MN frequency and the lowest NDI frequency were obtained from 10000 ppm at 48 h treatment while the lowest MN and the highest NDI frequencies were determined in 1250 ppm at 24 h treatment. This research showed that used concentrations did not produce significant MN frequency but significantly reduced the NDI value when compared to MMC. Zatta, P.; Lain, E.; Cagnolini, C. Effect of aluminium on activityof kreb’s cycle enzymes and glutamate dehydrogenase in rat brain homogenate. European Journal of Biochemistry. 2000; 267, 3049─3055. Ferrer, A. Metal poisoning. Anales del Sistema Sani-tario De Navarra. 2003; 26, 141─153. Lima, P.D.L. ; Vasconcellos, M.C. ; Montenegro, R.C. ; Bahia, M.O. ; Costa, E.T. ; Antunes, L.M.G. ; Burbano, R.R. Genotoxic effects of aluminum, iron and manganese in human cells and experimental systems: A review of the literature. Human and Experimental Toxicology. 2011; 30(10), 1435–1444. Exley, C.; Burgess, E.; Day, J.P.; Jeffery, E.H., Melethil, S., Yokel, R.A. Aluminum toxicokinetics. Journal of Toxicology and Environmental Health. 1996; 48, 569–584. Becaria, A.; Campbell, A.; Bondy, S.C. Aluminum as a toxicant. Toxicology and Industrial Health. 2002; 18, 309–320. Wedrychowski, A.; Schmidt, W.N. ; Hnilica, L.S. The in-vivo crosslinking of proteins and DNA by heavy metals. Journal of Biological Chemistry. 1986; 261, 3370─3376. Migliore, L.; Cocchi, L.; Nesti, C.; Sabbioni, E. Micro-nuclei assay and FISH analysis in human lymphocytes treated with six metal salts. Environmental and Mole-cular Mutagenesis. 1999; 34, 279─284. Banasik, A.; Lankoff, A.; Piskulak, A.; Adamowska, K.; Lisowska, H.; Wojcik, A. Aluminum-induced micro-nuclei and apoptosis in human peripheral-blood lymphocytes treated during diff erent phases of the cell cycle. Environmental Toxicology. 2005; 20, 402─406. Geyikoğlu, F.; Türkez, H.; Keles, M.S. The role of fruit juices in the prevention of aluminum sulphate toxicity in human blood in vitro. Fresenius Environmental Bul-letin. 2005; 14, 878─883. Ribes, D.; Colomina, M.T. ; Vicens, P.; Domingo, J.L. Effects of oral aluminum exposure on behavior and neurogenesis in a transgenic mouse model of Alzhei-mer's disease. Experimental Neurology. 2008; 214(2), 293─300. Hirsch, E.C. ; Brandel, J.P.; Galle, P.; Javoyagid, F.; Agid, Y. Iron and aluminum increase in the Substantia-Nigra of patients with Parkinson's-Disease An X-raymicroanalysis. Journal of Neurochemistry. 1991; 56, 446─451. Ganrot, P.O. Metabolism and possible health effects of aluminium. Environmental Health Perspectives. 1986; 65, 363-441. Matsumoto, H. Changes of the structure of pea chromatin by aluminum. Plant and Cell Physiology. 1988; 29, 281-287.
 WHO. Guidelines for drinking–water quality re-commendations. Geneva, Italy: WHO. 1996. Wikipedia. Aluminium acetate. http://en.wikipedia.org/wiki/Aluminium acetate#cite (Accessed on: 17 July 2015). Yellamma, K.; Saraswathamma, S.; Nirmala Kuma-ri, B. Cholinergic System Under Aluminium Toxicity in Rat Brain. Toxicology International. 2010; 17(2), 106─112. Sushma, N.J.; Sivaiah, U.; Suraj, N.J.; Kishore, S.; Javantha Rao, K. Aluminium acetate induced oxidative stress in brain of albino mice. J Pharmacological Toxi-cology. 2006; 1(6), 579─584. Nehru, B.; Bhalla, P.; Garg, A. Evidence for cent-rophenoxine as a protective drug in aluminium indu-ced dehavioural and biochemical alterations in rat. Molecular and Cellular Biochemistry. 2006; 290(1-2), 33─42. Çelik, M.; Unal, F.; Yuzbasıoglu, D.; Ergun, M.A. ; Arslan, O.; Kasap, R.In vitro effect of karathane LC (di-nocap) on human lymphocytes. Mutagenesis. 2004; 20, 101–104. Rencüzoğulları, E.; İla, H.B. ; Kayraldız, A.; Arslan, M.; Budak Diler, S.; Topaktas, M. The genotoxic effect of the new acaricide etoxazole. Russian Journal of Gene-tics. 2004; 40(11), 1300–1304. Gomez-Arroyo, S.; Diaz-Sanchez, Y.; Meneses-Perez, M.A. ; Villalobos-Pietrini, R.; De Leon-Rodriguez, J. Cytogenetic biomonitoring in a Mexican floriculture worker group exposed to pesticides. Mutation Rese-arch. 2000; 466, 117–124. Fenech, M. The in vitro micronucleus technique. Mutation Research. 2000; 455, 81–95. Sushma, N.J.; Sivaiah, U.; Suraj, N.J.; Kishore, S.; Javantha Rao, K. Lipid peroxidation and some oxidati-ve stress enzymes in aluminium acetate intoxicated albino mice. Toxicology International. 2009; 16(1), 1─4. Varella, S.D. ; Pozetti, G.L. ; Vilegas, W.; Varanda, E.A. Mutagenic activity in waste from an aluminum products factory in Salmonella/microsome assay. Toxi-cology In Vitro. 2004; 18, 895─900. Moreno, E.A. ; Rojas, G.F.; Frenk, F.H. ; De La Huerta, A.O. ; Belmares, R.Q. ; Vargas, A.R.O. In vitro induction of abnormal anaphases by contaminating atmospheric dust from the City of Mexicali, Baja California, Mexico. Archives of Medical Research. 1997; 28, 549─553. Dovgaliuk, A.I. ; Kaliniak, T.B. ; Blium, I.B. Assess-ment of phytoand cytotoxic effects of heavy metals and aluminum compounds using onion apical root meris-tem. Cytology and Genetics. 2001a; 35, 3─9. Dovgaliuk, A.I. ; Kaliniak, T.B. ; Blium, I.B. Cytogene-tic effects of toxic metal salts on apical meristem cells of Allium cepa L. seed roots. Cytology and Genetics. 2001b; 35, 3─10. Yi, M.; Yi, H.; Li, H.; Wu, L. Aluminum induces chromosome aberrations, micronuclei, and cell cycle dysfunction in root cells of Vicia faba. Environmental Toxicology. 2010; 25, 124─129. D’Souza, S.; Vijayalaxmi, K.K. ; Naik, P. Assess-ment of genotoxicity of aluminium acetate in bone mar-row, male germ cells and fetal liver cells of Swiss albino mice. Mutation Research. 2014; 766, 16–22. ISNAD Eren, Yasin , Akyıl, Dilek , Özkara, Arzu . "Genotoxic Effects of Aluminium Acetate by Micronucleus Assay". 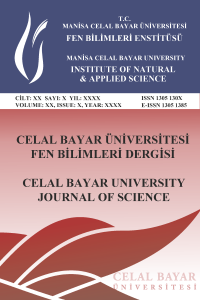 Celal Bayar University Journal of Science 13 / 4 (December 2017): 919-923.